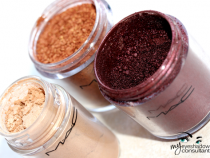 MAC Paint Pots: Have Trouble with Blue Eyeshadows? If You Have This, You Don’t Need That: PIGMENTS! 6 years ago by ZabrenaDupes! MAC Paint Pots: Make Purples POP!